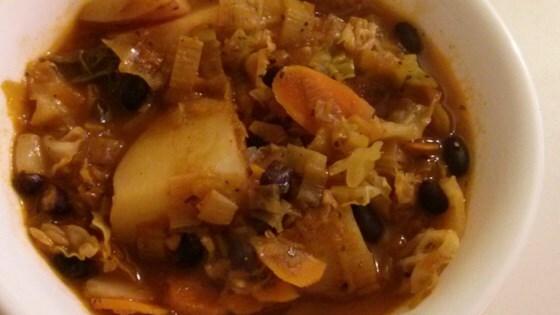 "Delicious & easy vegetable stew inspired by Providence's City Farm Manager, Rich. Organic, locally grown, and in season ingredients have the best flavor. Add a bit more cayenne for a tasty home remedy. Serve hot with warm bread." Heat the butter in a large pot, and cook the onion, leeks, and garlic until tender. Mix in celery and carrots. Stir in broth, tomato sauce, black beans, cabbage, and potatoes. Season with oregano, basil, black pepper, celery salt, cayenne pepper, and bay leaves. Bring to a boil. Reduce heat to low, cover, and simmer 25 minutes, stirring occasionally, until vegetables are tender. Top with Parmesan to serve.